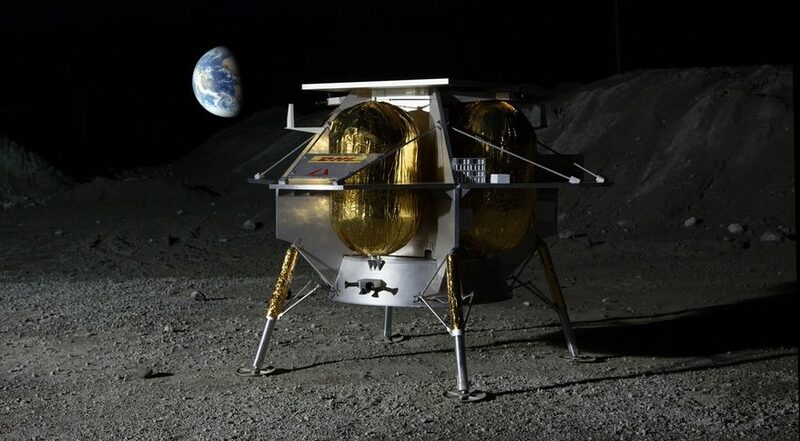 LONDON — As Astrobotic prepares to compete for NASA lunar payload delivery contracts, the company has signed an agreement with Dynetics for the last major component of its lunar lander. Under the teaming agreement announced July 17, Dynetics will provide a main propulsion system for Astrobotic’s Peregrine lunar lander, as well as attitude control thrusters. The companies did not disclose the terms of the deal. Peregrine will have five 150-pounds-force engines, using hydrazine and mixed oxides of nitrogen (MON) propellants, to send the spacecraft from Earth transfer orbit to the surface of the moon. The lander will also have 12 five-pounds-force attitude control thrusters. Dynetics is responsible for the overall propulsion system, including engines, tanks and related components. The engines themselves come from subcontractor Frontier Aerospace, a California company that developed the engines under a NASA contract. That includes the use of a variant of the MON propellant known as MON-25. That propellant has a higher nitric oxide content, which lowers its freezing point. “NASA recognized the need for this capability a couple years ago and had awarded a contract to Frontier Aerospace to qualify engines of an appropriate size for a small lander,” said Andy Crocker, space solutions propulsion department manager at Dynetics. The propulsion system was the last main component Astrobotic had to select for the Peregrine lander. “This completes the missing piece for the lander, and we’re quite excited that we have all the players ready to go,” Thornton said. Astrobotic has been working on lunar lander concepts for several years, more recently focusing on the Peregrine design. The lander is capable of placing up to 265 kilograms on the surface, but will carry only 35 kilograms on its initial mission scheduled for launch in 2020. Thornton said no changes to the propulsion system are needed to support later missions with heavier payloads. While Astrobotic has lined up about a dozen deals with commercial and international government customers, the company is currently focused on competing for NASA’s Commercial Lunar Payload Services (CLPS) program announced earlier this year. Under that program, NASA will buy payload space on small commercial lunar landers as an early step in a broader effort to return humans to the Moon. With NASA expected to soon release the final solicitation for the competition, Astrobotic and Dynetics have made a few tweaks to the Peregrine design, such as increasing the thrust of the main engines from 100 to 150 pounds-force. “It provides some extra margin for the highest payload capability,” Crocker said.